Coffee is a breakfast staple for most of us, perking us up to get us through the morning with caffeine and, for me, with its familiar flavor. A coffee-loving food scientist from Hawaii has finally merged coffee with breakfast food and has come up with a line of coffee (and tea) flavored, caffeinated breakfast cereals. Capuccino Crunch comes in Cappuccino, Mocha, Kona Blend and Chai Spice flavors, all carefully developed over a period of about two years to ensure that the cereal delivers the flavors as promised. It’s an all natural puffed rice cereal – gluten free, low sugar and cholesterol free – that is flavored with 100% arabica coffee beans (except for the chai flavor), and the Kona flavor includes 10% real Kona coffee. 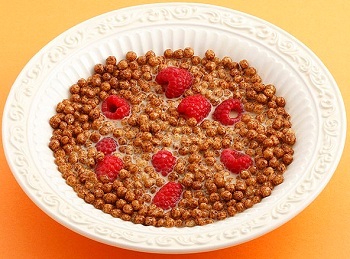 A serving of cereal delivers about 25% of the caffeine found in a regular cup of coffee. Tea lovers might also appreciate the fact that black tea and green tea are flavors in the wings, as is a decaffeinated coffee for coffee-lovers who want the flavor without the buzz. The packaging is done in coffee bags, which makes for a very attractive presentation, but means that you can only buy this cereal in very small quantities at the moment. Hopefully it’ll gain some traction with other coffee lovers and we might start getting a jump-start to the day with cereal and coffee sometime soon. For now, the cereals are available online for anyone who wants to give them a taste.